We are delighted to announce Intel Ireland as a Mega Sponsor of Dublin Maker 2014. Intel Ireland is celebrating their 25th anniversary here in Ireland. Intel will also be demonstrating their Intel Galileo boards at Dublin Maker 2014. Intel announced at the Consumer Electronics Show the Make It Wearable Challenge, a contest in which individuals, teams, and organisations are invited to submit a wide range of wearable product ideas in seven categories. 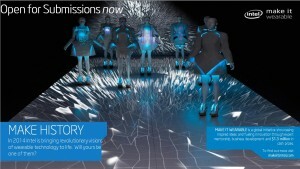 Calling All Makers The Intel “Make it Wearable” competition – exploring the potential of the Internet of Things (IoT) & wearable’s is open for submissions. Over $1,000,000 in prize money including a grand prize of $500,000. Read more about it here, gather your thoughts and get your submissions on line. For the Development track you need to sign up by June 24th, or June 15th for the Visionary track. Check out The Creators Project blog and the videos below for more information.